The Lambeth Autism Group invites all parents and carers to the annual general meeting. 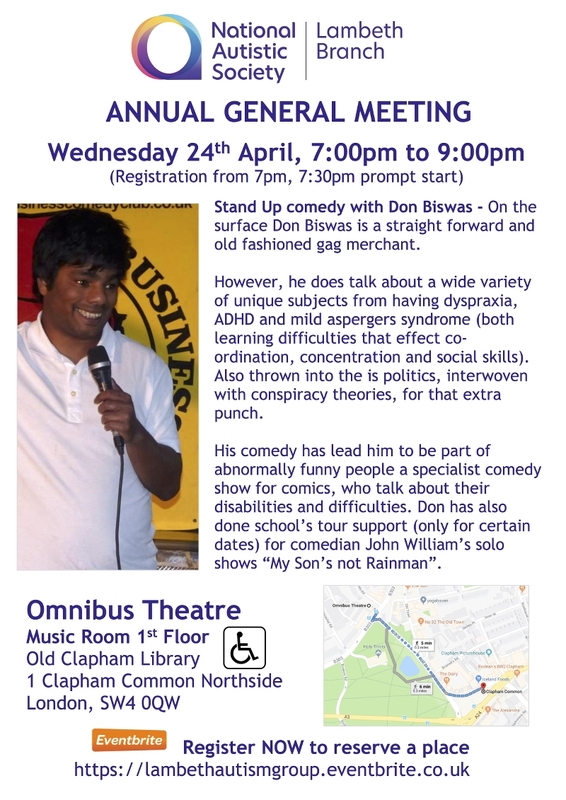 This will be held on Wednesday 24 April 2019 at Omnibus Theatre (Old Clapham Library), Clapham Old Town SW4 0QW. Admission is from 7pm, to start 7.30pm prompt, finishing at 9pm. The bar will be open from 7pm and after the AGM. Registration: Please register (to avoid disappointment) using Eventbrite or email Lambeth@nas.org.uk Ref: AGM Evening 2019.